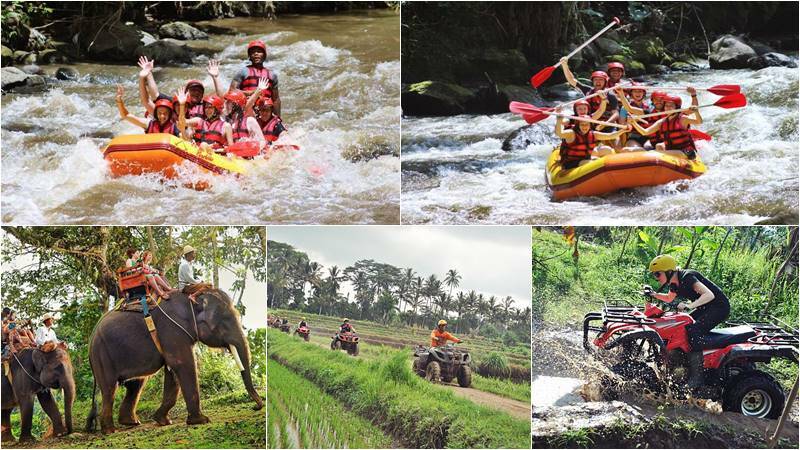 Bali Rafting + Elephant Trekking + ATV Ride is a combination of three adventures in one day and one of the most favourite Bali Rafting Package. Join our Bali rafting on the Ayung River, then combine with an elephant ride of 30 minutes with the beautiful view of the Ayung River and see the wild animal like monkeys and birds on the rides, and finish the day with an ATV ride in Bongkasa Village. 16.00 – Enjoy 2 Hours ATV RIDE at Bongkasa village with amazing trek view. 18.30 – After shower & change Transfer back to Hotel. Join our professional team on the Ayung River for fantastic water rafting adventures, enjoy a unique and unforgettable tour through winding gorges, the sumptuous jungle and the splendid terraced rice field. The water volume is stable throughout the year with few speeds of water, allowing you to have great fun. For safety standard, you will be fitted with helmets and life jackets from our beginning at the start point. Our experienced guides will lead you through your super thrilling Bali Ayung rafting adventure for around two hours. Follow his instructions and paddle along the way, laughing, shouting and having an unbelievable adventure. This is the best way to experience the wonder of the Ayung River. Take 1.5 – 2 hours to enjoy Bali ATV ride adventure, where you will drive along the beautiful countryside, rice fields and more natural sight awaiting us. Feel the true adventure of Bali only with us. All entrance ticket & Donation at schedulled stop. 2 hours ATV RIDE with all safety equipment & Instructor.